Team NiSCA recently announced their newest printer, the PR-C101. The printer offers the advantage of a rotating LCD panel that can be viewed from multiple angles, in addition to an optional front and back exit when printing the cards. The options make it flexible, and optimal for small work spaces. The NiSCA PR-C101 Rockets out of the Starting Gate The leading supplier of dye-sublimation ID card printers and laminators, Team Nisca offers 24-bit color, 256-grayscale image quality with smart card encoding capability, 100,000 cards MTBF reliability, and enhanced security. The new Nisca PR-C101 printer provides a simple and affordable out-of-the-box solution for high quality high durability ID cards with low maintenance requirements. 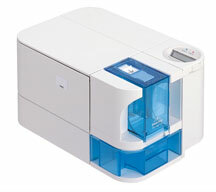 The printer is small enough to fit into an office overhead bin or under a counter. Offering the first ever rotating LCD panel and optional front or back exit, the PR-C101 can be placed in any orientation to fit your office environment perfectly. The printer’s ribbon cassette and cleaning assist roller unit is disposable. The PRC-101 comes packaged with an entry level badging software and offers an optional magnetic strip encoding. This basic professional solution is great for every small organization, including police, libraries, schools, clubs, casinos, etc. For more information or to locate a Value Added Reseller near you, please visit us at www.teamnisca.com. or call us at +1-732-271-7367. About Team NiSCA Since the NiSCA ID Card printer’s introduction into the marketplace in 1994, NiSCA printers have been producing high quality full color ID cards for Corporations, Education, and Government organizations. NiSCA Corporation offers a broad product line from ID card printers to document scanning systems to paper handing systems for the photocopier industry.